Brows. They have never really been my strong point. With a little bit alotta bit of practice, I feel I have now figured out how I like them best. It also took major self control and a whole lot of allowing the hairs to grow in without having them waxed as was my norm, for several long months. I quite minimally tweezed to clean up any stray hairs between my brows and underneath them every few days, but that was all. I highly recommend trying this to gain thickness and shape if you are struggling with your brows as well. On a whim, I decided to get them cleaned up a bit after 8 months of holding back fairly recently. Of course as fate would have it, alot of those much looked after brow hairs were removed. 8 months of hard work down the drain. I have now sworn off ever getting them done again and face a daily struggle of getting them to look just right. I am currently waiting very patiently for those hairs to finally begin to grow back in. So what am I utilizing to get my brows looking just right? For a while I stuck strictly to a taupe-brown powder and an angled brush when filling in my brows, and I continue to turn to that technique on a rushed morning as it's hasty. When I have some extra time and really want to get a perfected, defined brow look, Anastasias brow wiz is where I'll turn. The tip of the Anastasia pencil is so tiny which means no unintentionally overdoing it. It also makes it far easier to imitate individual brow hairs, producing a really natural look. 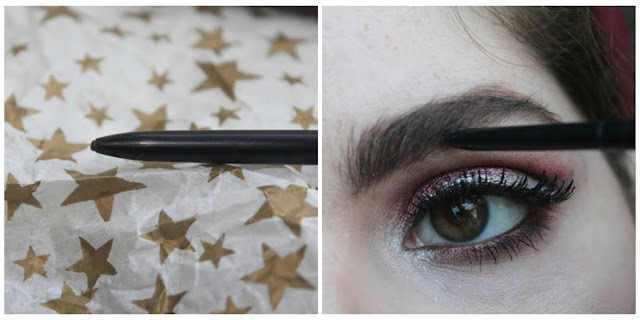 It has a waxy texture that keeps the brow color and hairs in place while giving off a very subtle, almost indistinct amount of shading, depending how hard you press it into your brows when applying. The color "medium brown" is a perfect match with it's just right ashy tones to fill my dark brown brows and still keep things looking soft. There are 9 different shades to choose from when shopping for these pencils, so there should really be something to suit everyone. An additional positive feature is the brow spooly attachment at the other end of the twist up pencil. It is a tool I rely on every time as it ensures my brows look more even and in place. I'm dreading the day it runs out because it is my favorite brow pencil to date! 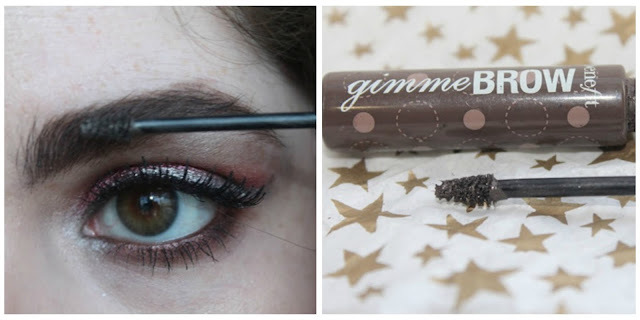 Benefit Gimme Brow is another product I've been playing around with and although I like it I am not set on it. Because it is a tinted brow gel, I feel the color needs to be just right and with just 2 shades to choose from- light/medium (the one I chose) or medium/deep, it is hard to get a perfect match. This color is a little bit too light for me and I feel like the darker one would be too dark. Although I can pull this shade off, I do think a slightly darker shade just midway between the two offered would be perfect. I have very long brow hairs that seem to really like to stand upwards or outwards, moving every which way throughout the day. A brow gel is therefore a must for me on the daily. As soon as I'm finished applying a powder or pencil product I will go over them with something like this to set them in place and keep them from moving around. As for keeping them in place, this certainly does the trick without feeling kind of crusty as some brow gels tend to. Apply too much and it can get uncomfortable though, so wipe off the brush before applying as a very minimal amount does the trick. The tiny little brush is the perfect size for depositing the correct amount of product where necessary as well. The idea is genius and I truly wish the color worked a bit better for me. Now that I have a brow routine that truly works for me in place, I may record my brow application with some tips and tricks for an upcoming video. If that is something you'd be interested to see, please leave me a comment below letting me know and I'll get on it. I've also been exploring other brow products recently now that I feel I sort of understand my brows better. Pomades, pencils, gels, I am testing it all to find the best ones to suit my taste. Get ready to hear more about brows around here! Have you given these brow products a try? If you have, what did you think of them? If you haven't. do you want to?